In memory of Walk of Famer and Father of Rock & Roll Chuck Berry, flowers were placed on his star on the Hollywood Walk of Fame on Monday, March 20, 2017 at 1 p.m. PDT. The star in the category of Recording is located at 1779 Vine Street. He was honored on September 28, 1987. “Chuck, Heaven has another Rock & Roll angel, RIP!” Ana Martinez, Producer of the Hollywood Walk of Fame signed the card on behalf of the Hollywood Historic Trust and the Hollywood Chamber of Commerce. The "King of Rock and Roll," Chuck Berry was honored with the 1,857th star on the world famous Hollywood Walk of Fame on Thursday, October 8, 1987 at 12:30 p.m. The star ceremony was held at 1777 N. Vine Street in front of the Capezio Dance Store. 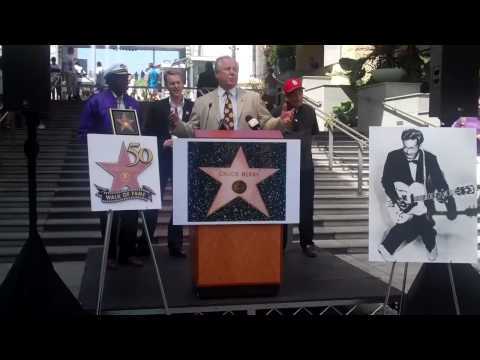 Johnny Grant, Honorary Mayor of Hollywood and Chairman of the Walk of Fame Committee, served as Master of Ceremonies with Bill Welsh, President of the Hollywood Chamber of Commerce (sponsoring organization of the Walk of Fame) officiating. The son of a carpenter, Charles Edward Anderson Berry, was born on October 18, 1926 in San Jose, California. Shortly after his birth, his family moved to Missouri, where he and his three sisters and two brothers grew up in Wentzville and in St. Louis. Upon finishing high school, Berry worked on a factory assembly line and then, after taking a night course in cosmetology became a hairdresser. In the early 1950's, already married and the father of two children, he supplemented his income by taking a job as a guitarist. In 1952, he formed a trio with pianist Johnnie Johnson and drummer Ebby Harding and the combo began playing regular weekend gigs at the Cosmopolitan Club in East St. Louis. While vacationing in Chicago in 1955, Berry met blues singer Muddy Waters, who introduced him to Leonard Chess, President of Chess Records. Berry auditioned two songs he had written, and one of them, "Maybelline," caught the attention of disc jockey Alan Freed who plugged the song on his New York radio show. Within weeks, "Maybelline" became one of the most popular songs in the country and one of the first to win a triple crown on the Billboard charts: number one in rhythm-and-blues, number one in country-and-western, and number one in pop. "Roll Over Beethoven" soon followed in 1956, a song which influenced millions of teenagers in America. Berry made his first national appearance in 1956, at the Brooklyn Paramount Theatre in Brooklyn, New York. It was at this show that Berry created his now-famous "duck walk." Formed while playing the most complex patterns on his electric guitar, Berry flashed across the stage with his knees bent and a fluid grace that quickly became his trademark. Among the greatest hits which Berry created include "Rock and Roll Music" (later recorded by the Beatles), "Round and Round," "You Can't Catch Me," "Johnny B. Goode," "Sweet Little Sixteen," "Nadine," "Back In The U.S.A.," "Reelin and Rockin," and "My Ding-A-Ling" to name a few. Berry has also performed in the films "Go Johnny Go," (1958), "Sweet Toronto," (1971), "Let The Good Times Roll," (1973), and "American Hot Wax" (1978). Berry's most current movie is "Chuck Berry Hail! Hail! Rock 'N' Roll" which was released by MCA Universal on October 8th and was a limited release on October 9th. The movie is a triumphant celebration of Chuck Berry's 60th birthday party concert, a tribute to the rock pioneer whose musical renditions have inspired a legion of admirers and imitators around the world. The movie also features performances by Eric Clapton, Robert Cray, Etta James, Julian Lennon, Keith Richards and Linda Ronstadt and provides rare footage of Berry's private life - a rousing salute to the man who single-handedly changed the sound of contemporary music forever.